Product: SB5800-BlackMakoto Commercial Home Exercise Upright Bike with 40lb Fly Wheel, Electronic Console, Wheels, K5 Shock, Adjustable Handle Bars & Seat, Arm rest and Pro Pedal with Straps. 8 magnetic resistance levels (unheard of with most bikes)! Please note that we do not carry parts for this or any other bike we sell or have sold. Manufacturers Suggested Retail Price is $1100. Other comparable commercial bikes run for $1300. This high quality bike is now available for home use at a discounted price. Get in shape at home. 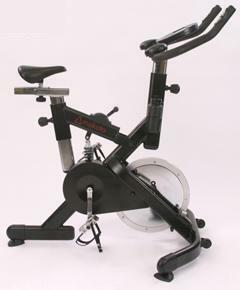 This exercise Upright Bicycle provides a great cardiovascular workout with multiple resistance levels, electronic console to measure speed, pulse, calories and distance. Handle bars and seat adjusts to vary your workout. Dimensions: 44" x 44" x 12"